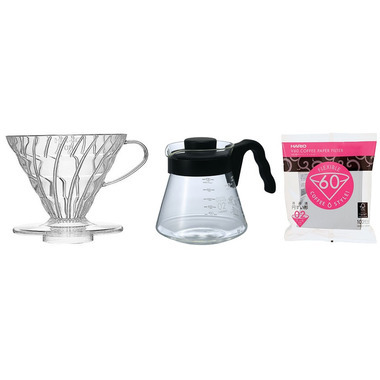 If you're looking to get into pour over coffees, this kit is a great place to start! 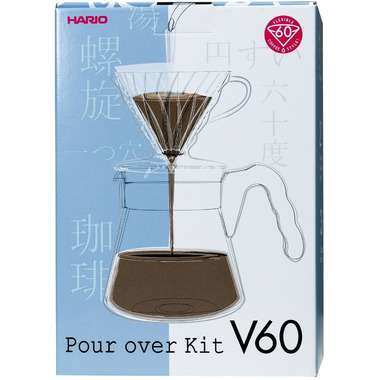 This great value kit comes with a Hario V60-02 Clear Coffee Dripper, a Hario V60-02 Diner Coffee Server, and a 100-pack of white V60-02 filters. Got this on a whim as I'd been thinking of trying this method for making my coffee and the price is right. This is a cute kit and all you're missing is a grinder (burr grinders are best), coffee beans and something to pour the water (if you're kettle is unwieldy). The instructions are very clear. The whole process invites you to slow down and it's been a great way to enjoy my mornings and ease into my day when I'm off work. The flavor of the coffee is a bit different, milder than with my brewer but that's a plus in my books.